That’s the thing about streaks; eventually, they come to an end. It felt good for the Oklahoma City Thunder to finally run off a couple wins. Seven straight wins put the train back on the tracks. The Thunder suffered a tough break with Kevin Durant’s sprained ankle before the half, as he was probably having the best first half of his career. Thirty points in 18 minutes of play was quite memorable. The Thunder hung around, but the Golden State Warriors proved to be too much for them in the end. The only solace is that the end of one streak usually signifies the beginning of another. The question is whether it will be a winning streak or a losing streak. 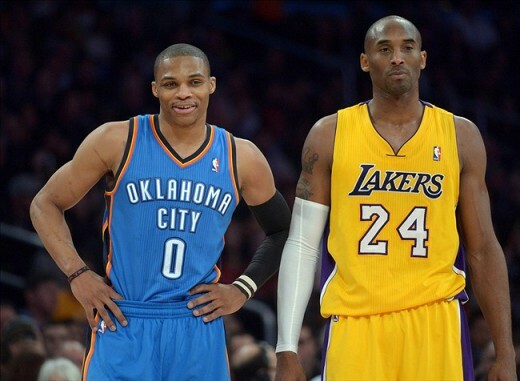 This will be the first of three meetings between the Thunder and Lakers. The Thunder won the season series 3-1 last season, winning two of those games by at least 25 points. These are definitely not your father’s Lakers. They currently have an 8-17 record, but have won 3 of their last 4 games. 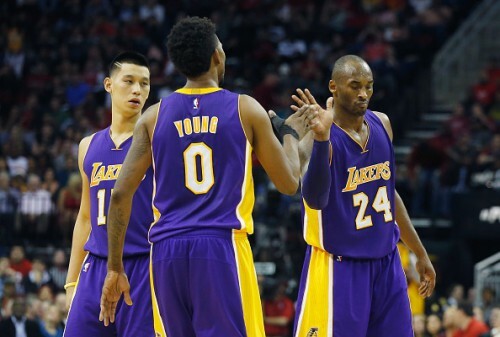 Their recent hot streak has coincided with the return of Nick Young. The addition of another scorer/ball handler has taken some of the pressure off of Kobe Bryant and allowed the Lakers’ offense to open up a bit. The issue with the Lakers though, has been their defense. They are allowing the most points per game in the league at 109.5 points, and have the league’s worst defensive rating (113.7). After failing miserably in free agency, the Lakers had to cobble together a roster and this is the result. At point guard, the Lakers used Jeremy Lin to begin the season, but have gone with Ronnie Price lately. Price is the better defensive player, but can’t provide the threat offensively that Lin can give you on some nights. On the wing, Kobe Bryant can still fill it up. Though injuries have sapped some of his athleticism, Bryant still has the intelligence and moxie to do what he needs to do on the court. Wesley Johnson gives the Lakers a 3 and D guy that can run the floor in transition. A lot like the point guard position, the Lakers started the season with Carlos Boozer at the 4, but have since gone with the more athletic (and younger) Ed Davis. This appears to be a offense to defense move in that Davis is better on the boards and defensively. Up front, Jordan Hill is a near double double threat on most nights. Off the bench, the aforementioned Young will start the game off the bench, but usually finishes the game out with Bryant. The demotion of Boozer and Lin actually bolster the bench and gives the Lakers more options in their closing line-ups. 1. Run, Russell, Run – This team allows the most points in the NBA. Opposing guards usually get past the first line of defense and into the paint quite easily against the Lakers, which puts the rest of the defense at a disadvantage. Russell Westbrook is one of the best guards at breaking down the defense at the point of attack, and should have his pick of the litter in this game. Also, the older nature of the Lakers makes them susceptible in transition. And Westbrook is a one-man fast break on his own. Also, I think we see good Reggie Jackson in this game. 2. Roberson – It’s been a joy seeing this young guy blossom into one of the best perimeter defenders in the league. Now he gets to defend the “badge of honor” of perimeter players. 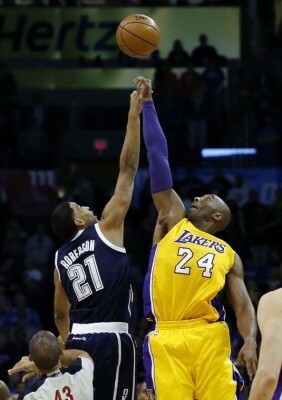 Even in his old age, defenders still look forward to locking down Kobe to see where they stand. Hell, Roberson may need to slide over onto Young if he starts to get hot from the perimeter. 3. Start a new win streak – The rest of this season will be about winning blocks of games. It will be about looking at the rest of the schedule in 5-8 game increments and needing to win at least 60% of those games. The Thunder need to win the games that they are supposed to win, and this is one of those games.